If you are interested please join us. 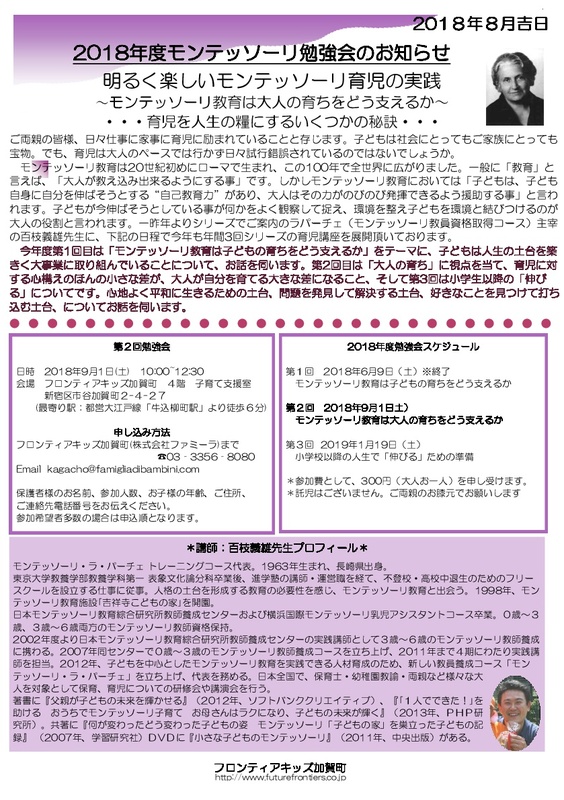 For details, please see the leaflet. 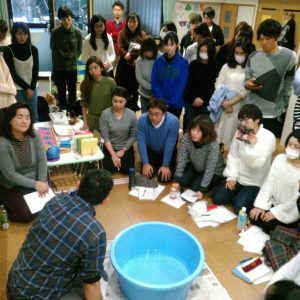 On Saturday, January 27, 2018 We are greeted by Mr. Yoshio Momoeda,president of Lapache (Montessori teaching qualification acquisition course) at Frontierkids Kamiuma, as a lecturer, about the third time of study for year of 2017 "growing" after elementary school students. I found a foundation to live peacefully pleasantly, a foundation to discover and solve problems, and a foundation to find and drive what I like. 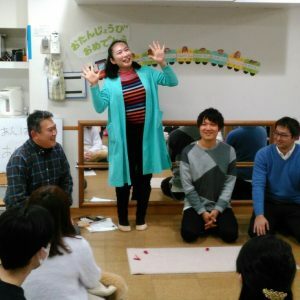 regional parents of people, and those who worked at the childcare site from now on also participated. Montessori education was born in Rome in the beginning of the 20th century and spread all over the world in the past 100 years. Generally speaking, "education" is "to make it possible for adults to teach". However, in Montessori Education, "Children have" self-educational ability "trying to extend themselves to the children themselves, and adults are said to help them to exercise their abilities more frequently. 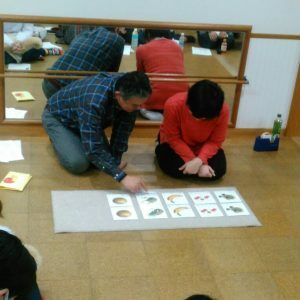 It is said that the role of adults is to carefully observe what kind of thing the child is trying to stretch and arrange the environment and link the child with the environment. "Preparation for [to grow] in the life after elementary school"
Adult mission = to help children become happy adults. Basically leave it to the nursery school! (elementary, junior, high school) or more during the student days. Communication skills required to collaborate with people. is to treat others with respect. School refusal that possibly falls down to any child and to any family. Were you ready to "grow" through this study session? In the afternoon, it was training sessions for staff. The first picture is "red card play" of the language. Pull the card, and the verbs written there "stand" “laugh" "walk"
We will do what we do and hit what another person is doing. The second picture also "red card play" of the language. "Raise the both hands to laugh" There are several actions coming out. 短い文が読めるようになった子が動詞は動作を現す言葉だということを身体を動かしながら学びます。When the child can read short sentences,then learns while moving the body that the verb is a word that expresses action. The third picture is the "picture card matching" of the language. I will do it as preparation stage for "writing" without using writing materials. The fourth piece is the "birth of the universe" of culture. There was a little cut of aluminum foil which was considered "dust"
Then "dust" sticks little by little and becomes "star". In this way I introduce how the Earth in which we live and other planets are born. 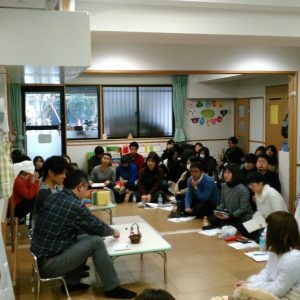 It was the last Montessori study meeting this year. at the workplace and at home.